Organic spray deodorant with 98,9% organic ingredients. With 75% mild organic aloe vera that soothes the skin. This deodorant by EnergyBalance™ is natural, fragrance-free, hypoallergenic and DOES NOT CONTAIN ANY aluminum, alcohol, artificial colors, paraben, petrochemicals, phthalics, propylenglycol or animal products. The special formula with natural minerals and organic aloe vera is a mild, soothing antibacterial product, producing amazing results even in the most sensitive areas. This organic deodorant slows the production of bacteria and prevents build-up of unpleasant odors. It won't stain your clothes or leave residue on your skin. Because of controversial discussions about deodorants containing alum, EnergyBalance decided to make an organic deodorant that does not contain crystal alum. This deodorant is made from 97% organic ingredients and contains 75% organic aloe vera. 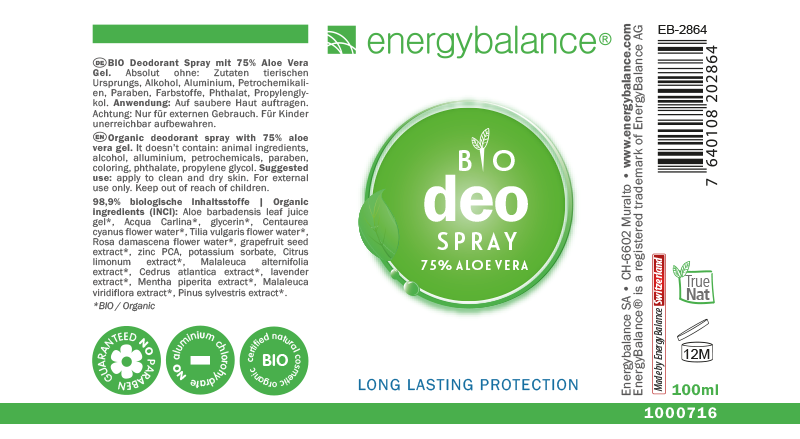 The EnergyBalance™ organic spray with 75% aloe provides effective protection against unpleasant odors throughout the day. And it won't stain your clothes or leave residue on the skin.